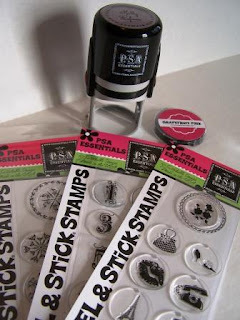 and I have loved PSA Essentials stamps for soooooo long. My friend carried them in her wedding store and I eyed them regularly. and I get to give one away to one of you! there is a world of creativity at you fingertips! 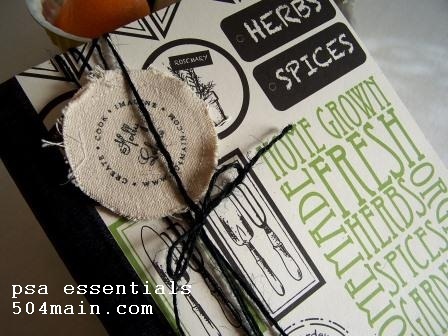 Then I covered a composition book to use for jotting down new recipes and kitchen notes. I embellished a canvas circle using the Gillian stamp personalized for me. (keep your hand off my recipes!). I loved the way this stamp look on the canvas...so I stamped up a few more to decorate my new bulletin board too (see top photo). and personalized some blank notecards! You can also remove the middles of the stamps and swap them out - more ideas are running through my head! See...I told you PSA Essentials are amazing! "PSA Essentials offers the only switchable personalized stamp. Every stamp (purchased after July 1, 2009) includes Peel & Stick® patent-pending technology, allowing the design of every stamp to be switched with any other PSA Essentials stamp die - a personalized die, a prepackaged design middle, a collegiate die -- ANY stamp design we offer." 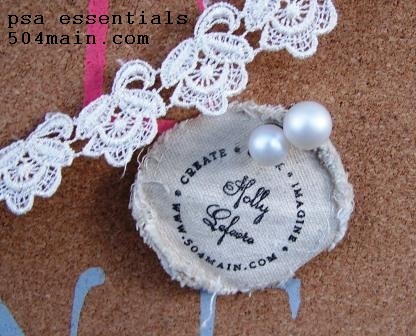 This leave you with so many choices of designs and inks to use with your imagination! 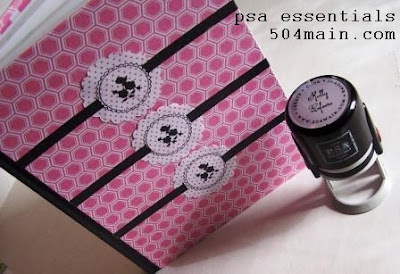 It is so easy to switch out inks and stamp designs with PSA Essentials. 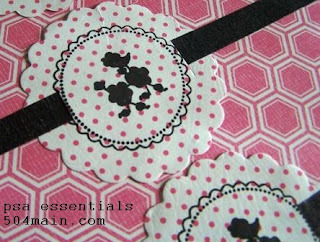 change inks and peel and stick stamps. 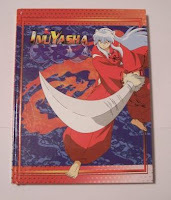 One winner will be randomly selected on Thursday March 1, 2012. Winner will have 48 hours to claim prize. 2 - Twitter: Sample tweet: "Let's create! Win a PSA Essentials custom stamp @504Main! http://bit.ly/zSMAUn"
disclosure: see my full disclosure by clicking on disclosure in the top navigation bar. 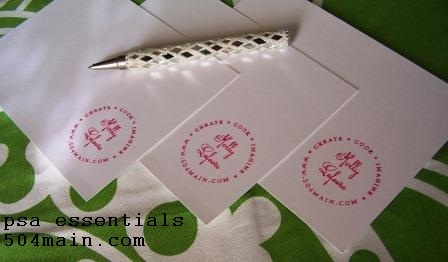 One personalized stamp, 2 inks, and peel and stick stamp packs were provided to me for review. One stamp is being provided for a giveaway. Love these stamps! Just commented on their blog post with "Guest Designer - Jamie Cripps". Thank you! i left a comment on their blog. lovely giveaway! 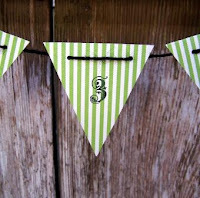 Great post and love your projects!! I left a comment on their blog....such an amazing giveaway! I left them a comment on the handmade journal post! I like you and PSA Essentials on FB! I had no idea their stamps were interchangeable!! Too cool!! I follow you! Thanks for the chance Holly! Followed via GFC as lepond! I left a comment on the tutorial photo holder page. That was a really neat craft. I liked PSA on facebook. Just found your blog, yay! I've been thinking of some sort of a stamp or embossing something or other for my new business, and this looks like something I could really get creative with! Awesome! (I left a post on PSA stamps blog too... Thanks for the contests and the chance! I'm also following you via GFC! I follow you, like you twice (me and Redoux) and I commented on the PSA blog. I do love stamps, now I just need to bust them out every once in a while. I left a comment on their blog telling 'em I was visiting from 504 Main. I commented on their most recent post complimenting the stamp with a blog name and website! I just left a comment on the PSA blog...so cute! OMG! How cool is this giveaway!!! I went over and left a comment on her photo holder post. I absolutely love it!!! I commented on the Photo Holder Tutorial. Boy could I use this! I find myself the mother of a groom AND the mother of a bride at the same time, the possible uses are endless! I left a comment at PSA and liked both you and PSA. I follow you!! Would love to win a fun stamp. I left a comment on their blog. Thanks for a chance to win such a fun prize! Left a comment on their blog on a post with the most adorable pink ballet invitation - so cute!!! 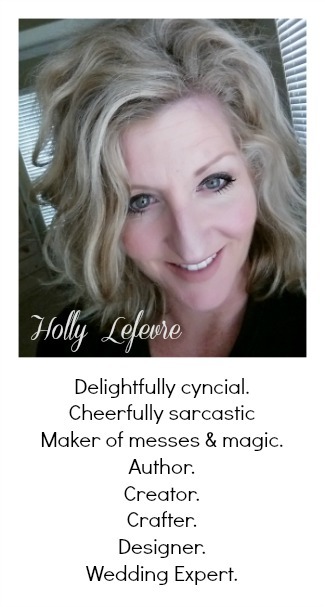 I receive your emails - love them!!! Left them a comment, on their feelin' moody post- they don't make it easy, they have comment moderation! Hi - I left a comment on PSA's blog! I followed your blog - and I liked your page and PSA's page on Facebook! I already liked PSA but I did comment on their post "CardMaker Newsletter"...Thanks for the chance to win such a cool stamp. I commented on the blog! I commented on her blog post about the picture holder! Shared and tagged on FB! I just commented on PSA Blog's Valentine Day Scrapbooking post! Gret card and use of stamps! Also became a follower of your blog! Also sent out a tweet abou 504Main!! Made a FB post about you all too! I commented on the cute Winter Fun Layout post! I left a comment on the adorable photo holder!